Cupcakes 'n Daisies: Crazy Eights - The Big Reveal . . . . .
Thelma I LOVE it...I absolutely LOVE it! I'm nuts about the border! And sweet Cooper did such a good job! Thelma, that border is SPLENDIFEROUS!!!! And perhaps Cooper's issue was that he blended into the background too much . . .
Just love the quilt! But more so love the way that you used the strips to border it... a perfect finish! Love the piano key border! Quilt turned out gorgeous! It's absolutely beautiful and I believe I like it even better with the darker border you added! Good Job! Your border makes the quilt POP! It's the perfect ending of a wonderful quilt journey. Love the quilt and love it even better with that piano key border. I especially love the way you finished the corners! Adding the border made that quilt drop dead gorgeous! Way to go! Love how you added the border. Gorgeous! Oh!!!!! Brilliant!!! I love that outer border, and love what it did for the quilt. Way to go! I love your last addition to the quilt! That border makes it perfect. ALL I can say is WOW. That border really made that quilt top pop. It is perfect for it. You did a Good Thing with the leftover strips. That made a lovely border and the whole quilt is stunning. 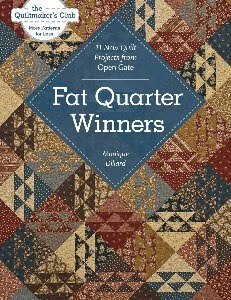 It's a good pattern, but the quilter is the one that makes it outstanding! Wonderful, very dramatic with the wide, white border and even better when you added the pieced outer border. Congratulations! Love the border you added...it is perfect! Sure got a chuckle from the Cooper photo shoot...what a character! I'm guessing you have jumped into Twinkling Lights?!? I love the border. It adds some pizazz to it. the outer border adds that sumpin sumpin, doesn't it?!? very way cool! and i love Cooper's tail - that dog has the CUTEST behind!!! 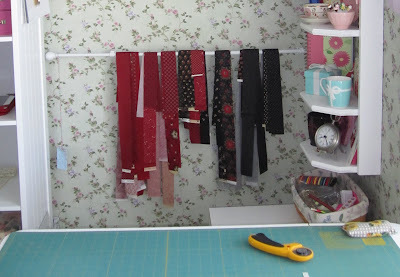 Just love the border using your leftover strips ! The border is perfect and finishes the quilt off nicely! I just love the picture of Cooper yawning and looking so border . Just priceless ! The border just gives it that WOW! factor. Gorgeous!! Such a beautiful quilt. The piano key border you added from your leftover strips was the perfect addition to this quilt. Love it!!! Liked the finished center but LOVE THE TOP with the border you added. You are right, that did it (and no waste too)!! Bet Copper wishes he had stayed to pose with that one! You took that wonderful pattern to a new level with your border treatment! It is just fabulous. I love how you tried to capture the "Open Gate" feeling by placing Cooper in front of the quilt for a photo. You just have the best sense of humor Thelma! Great idea for the border--really makes the quilt sing! That outer border of stripes really makes the quilt! I like how you mitered the corners. Very striking with the stripes making chevrons there. Payday needs to hurry up so I can get this book!! 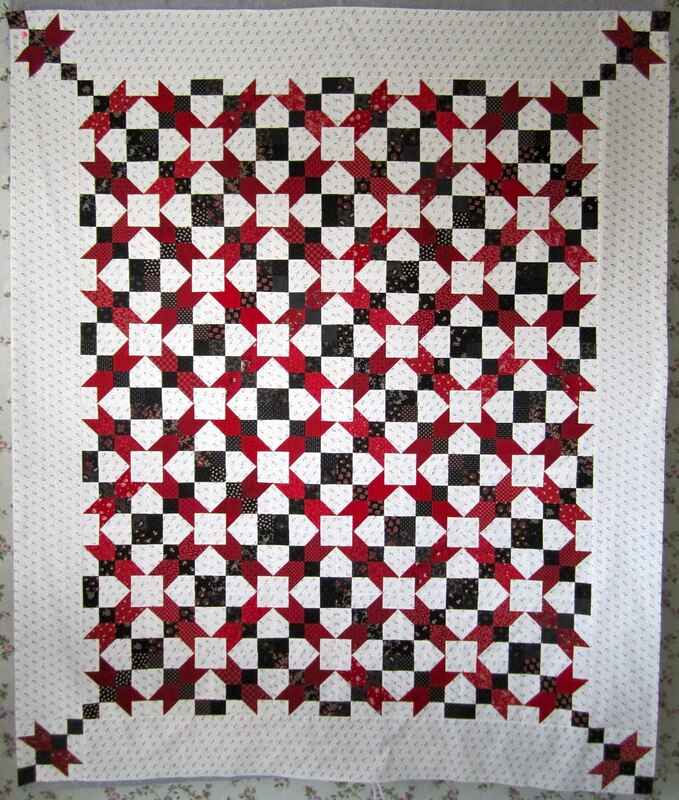 The pieced border sets the quilt off perfectly. Nice choice. Again, thank you and I still can't believe it! I never win anything! I guess there's a first for everything. By the way, Cooper looks absolutely adorable in these photos, even the one with his tail as he's making his escape. Love your quilt! The way the blocks extend to the corners is so cool and the border is great! Love it! The border really makes it sizzle. I love the quilt, then when I went further and saw the borders I nearly fell over! Fantastic idea, Thelma! Thank you so much for a great book tour and congratulations to the winner! Even Cooper made my day with the beautiful smile! Great finish! 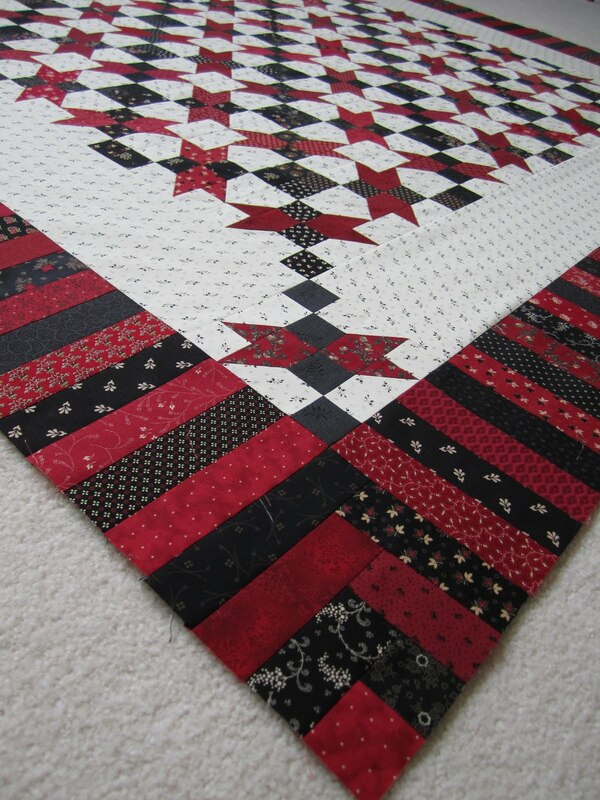 That piano key border makes the quilt POP! 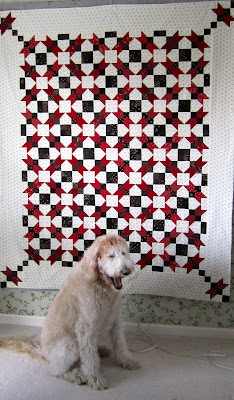 Love the quilt and that border really gave it a "super wow" factor. Love how you did the corner edge, someone said Chevron? 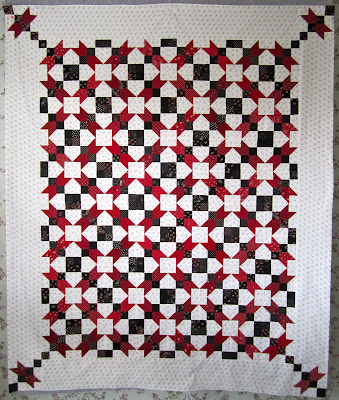 Maybe you can do a tutorial on how you did that, it is such a cool way to finish off the quilt. Amazing! Your left-over scrap border is great. Totally makes that quilt shine. LOVE it- especially the added border-even prettier than the one in book! Your border of leftovers absolutely made that quilt. Don't ya love it when you surprise yourself? 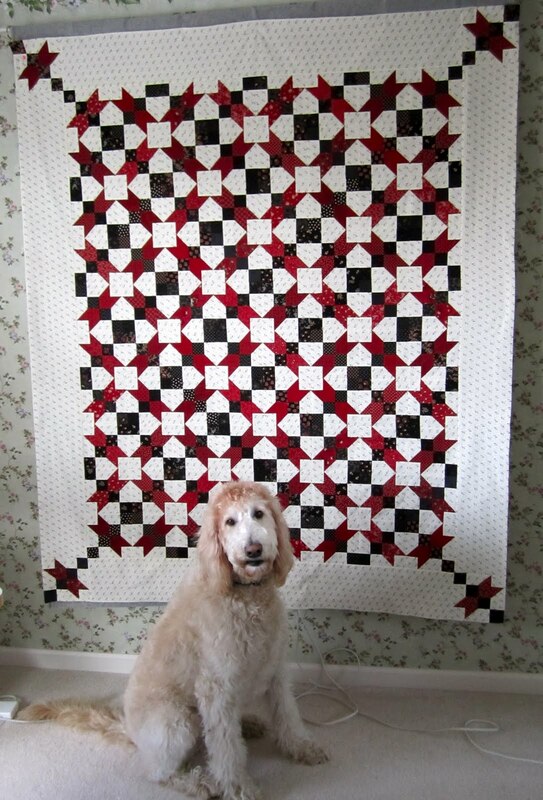 This is a great quilt, Thelma, and the border really finishes it! That border is AMAZING! It totally compliments that quilt! (I thought it was great without the border, but with it - WOW!) Congrats on a great finish! Thelma your quilt is beautiful!! I love the extra boarder you added, just the right touch! Thanks for the blog tour , I enjoyed it!! Love the quilt! That piano key border makes takes it from really nice to terrific! 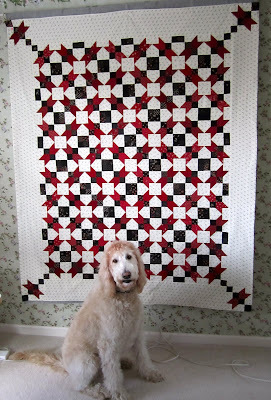 Love that quilt and the added strips make it even better! Cooper is sure a cutie! Thelma love how your quilt turned esp. after you added the border. Wow what a difference it made. Cooper smiling in front of the quilt - the happiest thing I've seen this morning!! LOL!! I will join the chorus of oohs and aahs for your border. Lovely.